1. Small piles and pellets that resemble sawdust collecting inside or around your house. 2. Swarms of flying ant-like creatures around your home in the fall season. If you see one of the above indicators of termite infestation, you are advised to contact Knockout Pest Control to come out and perform a termite home inspection, either of the entire house, or of the area of concern. Local treatments for termite control are specified locations that are determined to have a drywood termite infestation. 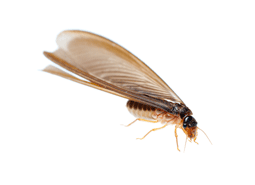 Local termite control treatments, also known as spot treatments, include wood injection or topical application of termite control treatments for drywood termite extermination. Additionally, localized spot treatments of targeted areas affected by drywood termites can eliminate your drywood termite infestation completely. Heat treatment is a primary treatment for drywood termite infestation. Heat treatment for termite control means termite extermination without the need for chemicals. Termite heat treatment is a whole area treatment that eliminates termites that you can see and those that you cannot see. As a termite company, we perform heat treatment for commercial termite control and home termite control to treat areas by performing area-specific treatment. We heat up the interior of the wood with specialized equipment that raises the interior temperature to about 135 degrees and hold it there for one hour. This treatment is a green termite control that is so safe for your home that you do not even have to leave while we are performing the heat treatment. Tent fumigation for termites is one the only options for whole house termite control treatment. Tent fumigation is a highly effective form of termite extermination, administered professionally by a termite control specialist. The termite fumigation process involves tenting the area and administering an odorless, non-residual gas. The gas used for termite tent fumigation does not cling on furniture, carpets, walls, bedding, or any other part of your home. Typically, termite extermination by way of baiting is done in attics, sub-areas like basements, and in the areas around the perimeter of the home. Termite infestations, dry-rot, and fungus can compromise the integrity of wood components in your home. Because of this, wood repairs are often required to restore the structural integrity of your home or building, depending on the length of infestation, type of infestation, and extent of infestation. Knockout Pest Control and Termite stands out among other termite exterminators because we employ licensed and experienced carpenters and tradesmen. We are able to repair and restore your structure efficiently and correctly. When structural repairs are required, our customers can rest assured that our experienced carpenters and licensed tradesmen perform those structural repairs. Our licensed crew is capable of performing small wood repair jobs like replacing a simple length of fascia, as well as larger scale repairs including structural beam replacement, deck re-builds, and even whole home rebuilding. Structural wood replacement and repairs can include roof repair, stucco, drywall, and painting. At Knockout Pest Control and Termite Control we promise our customers that we will always provide comprehensive, professional, licensed service. This means that, in cases like wood replacement, we do not just prime the wood we paint our repairs and leave you with a flawless finish. And Knockout Pest Control and Termite wood replacement and structural repairs are guaranteed to be performed correctly.